There’s nothing fun about going to the laundry mat. Not only do you have to deal with the headache of waiting for your dirty laundry gathering up in one corner of your home until you have enough to justify packing it up and taking it to the laundry mat, you have to also deal with travel expenses, the headache of keeping track of the machines your using, and the hassle of being in a small space with people who are every bit as stressed as yourself. On top of all that, even though you fed twenty dollars’ worth of quarters into the various machines, your clothes never seem to get quite clean enough or quite dry enough. The less you can go to the laundry mat, the happier you’re going to be. The best way to reduce the number of times you have to suffer through the indignity of going to the laundry mat, is making sure your personal washing machine stays in good repair. Keep track of the size of loads you wash. Resist the impulse to over stuff the machine. You will regret it. By sticking to a standard sized load, you will find that in addition to reducing the amount of wear and tear you place on your washing machine, you’re also going to discover the smaller load size also creates cleaners clothing, because the water and soap gets to all of the clothing, cleansing them properly. Keep you energy bills as low as possible. A well maintained washing machine is one that uses minimal power. a little more work, but we maintain, that, as long it’s properly cared for, you should get years and years of use from your appliance and experience very little trouble. The only think the continued use of the machine accomplishes will be the increased chance of you doing more damage to your appliance, and increasing the amount of repair work that needs to be done. Unlike our competitors who often act as if there’s no reason to hurry to your home or place of business, we know understand exactly how stressful the malfunctioning appliance can be. We see no logical reason to further compound your stress by making you wait several days for the needed repairs, or to give up a day’s work so you can wait around for a repair person who refused to commit to a set time. 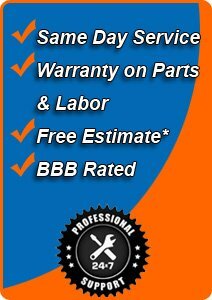 We offer same day service. We make it a point to keep our business ethical. Not only do we provide an estimate, you can rest assured that it’s an accurate estimate. Way back in 1986 we vowed we’d honor any estimate we provided. You don’t have to worry about hidden fees or gimmicks. We won’t even charge travel expenses. There’s not a single problem we can’t handle. No matter what issue you’ve encountered will get it fixed right away. We’re so confident in our ability to manage a lasting repair, any follow up service call will be free of charge. We have someone standing by right now to provide you with the assistance you need. You can reach them 24/7. If you call us soon enough, we can send one of our brilliant technicians to your home or business and have the problem solved before any dirty laundry accumulates. Michael came out to fix my washer. It wasn’t agitating. He was able to repair it on the spot.